How to measure the Melting Point, Freezing Point and Latent Heat or Total Heat Available in the Useful Range of Temperature in a Phase Change Material PCM? You can measure the Melting Point, Freezing Point and Latent Heat or Heat in the useful range for PCM - Phase Change Material by many methods. One such method is by using a Differential Scanning Calorimeter (DSC). The other method is the use of traditional Melting Point Apparatus and Calorimeter, often called Thermal Analysis (TA). Researchers know the usefulness, strength and limitation of DSC and TA. The following points are for new users and students of PCM. a) DSC is a precision instrument. It is useful for getting quick results in the form of Energy-Time diagrams (Thermograms) by using very small sample say 1-10 mg.
b) It is not primarily designed for Phase Change Material. DSC is rather a severe test for PCM - Phase Change Material, says A. Abhat and it fails to provide meaningful information on Super-Cooling. Latent Heat and Melting Point are better determined by Thermal Analysis. [1,2]. Considering the successful application of Salt Hydrates as PCMs in commercial application, says Hans & Sara the pioneers in PCM - Phase Change Material research, the failure to establish the stability in DSC measurements made the method of measurement suspect. In DSC the rate of temperature change is too fast and sample too small, to correlate well with the conditions encountered in practice. They further say that the position of the temperature sensor in the DSC is also suspect. c) DSC is a lovely apparatus, costing a little more than the big car of the “Big Boss”. It is fun to work on it as students and first timers. However it is important that a serious researcher tries to come closer to the real life situation by taking the biggest sample and indulging in slowest possible heating rate. The researcher must only use DSC for quick references and correlating the reading for further observations. Final observation should be done by TA method only. It will not be out of place here to stress that every advanced apparatus is based on basics. It was developed to hasten the basic measurements and not to over-rule the same. We are reproducing below some comments of interest form the published literature. The language seems to be auto-translation but clear in the message. 2. School of Engineering, University of Durham, South Road, Durham, DH1 3LE. 1. All researchers are practically limited with measuring melting temperatures and heat of fusion of promising latent heat storage materials. Main methods to be used by investigators in studying thermal properties were the differential thermal analysis and the differential scannining calorimetry. It is known that the results obtained with using these methods differ from results registered by classical methods. In spite of the fact that the measured temperature interval is low and the values in heat of fusion are sufficient we have sufficient discrepancies in published data. These facts show us that the accuracy of used express methods is not enough. It is easy note that there are no with rare exception measurements of such important thermal properties as: the temperature dependence of heat conductivity, heat capacity and density of promising PCM. In the light of abovementioned it should be concentrated the efforts of researchers in determination of temperature dependencies of perspective PCM. Especially it is necessary to study thermophysical properties of some pure substances with melting temperature in the range from 0 to 150 ºС which can be accepted as reference material and distributed from national institutes of standards for using by all interested researchers in calibration of their experimental devices and equipments. The distributed by manufacturers of express methods equipment reference materials have not as rule the correspondent certificates. Other requirement is all publications contented results of measurements of thermophysical properties must give all data on purity of studied materials, manufacturers, prices, and detailed procedure of measurements. Paper presented at the NATO Advanced Study Institute Summer School on Thermal Energy Storage for Sustainable Energy Consumption (TESSEC), Çeşme, Izmir, Turkey, June 6-17, 2005. We at PCM Energy, request the cooperation of users and researchers in establishing “Standard to test thermal energy phase change heat storage product”. 1. Use the Melting Point apparatus that you have used in your university days. If you have not used any, you can consult any graduate student. The apparatus will not cost more than a couple of dollars. a) If you know the Melting Point, you can quickly heat the material to come near the melting point and then proceed slowly. b) For Cooling use cold water near the Freezing Point. Avoid Thermal Shocks. c) Avoid Shaking, unless your usage permits the same. To obtain more reliable data, better carry out latent heat determinations with large samples, say of 60g or more of Phase Change Material. The sample container with the solid sample is submerged in a weighed quantity of water say 600g within a Thoroughly Insulated Flask or Dewar. The water is heated by passing a measured stabilized electric current through a resistance coil (or any other method). The water has to be mixed well to ensure good heat transfer. Magnetic stirrers introduced errors in the measurement of the thermocouples due to induction, the sample vessel is built in an annular form and a mechanical stirrer is passed through the axial channel. This design also decreases the path which heat has to travel in order to reach the working fluid, and thereby improves the time constant of heat transfer without appreciably reducing the mass of the sample. The thermocouples are connected to a computer which calculates the difference between the electric energy input and that needed to raise the temperature of the water (+ water equivalent) in the Flask. This value H is plotted against the average temperature T of the sample. The straight parts of the curve, before the occurrence and after the completion of melting, are both extrapolated to 29°C (As per the Melting Point in this example). The heat of melting is calculated by dividing the difference of H values at this temperature by the weight of the sample. This method gives consistent results with different heating currents. The extrapolation from the straight lines before and after melting corrects for errors due to uncontrolled heat losses. The sensitivity of the temperature sensor/s are many orders of magnitude faster than the rate of change of temperature. One run takes typically 4-6 h. The sketch of the apparatus is shown in Figure 2. Take a Standard Thermos Flask of 750ml-capacity, the one which you use for carrying tea-coffee to picnics. Fill it with 600gm of water at about 40°C for a few hours and keep it in an Air-conditioned room which is at say 25°C. Take accurately 60 gm. of Phase Change Material (say one melting at 30°C) in a thin screw cap bottle and dip it in chilled water from a refrigerator for a few hours and let the temperature stabilize at about 20°C. Measure the temperature of 600gm of water accurately. Insert in the flask the 60gm. PCM tube at about 20°C (Measure the temperature accurately). Close the flask, insulate it with blankets to provide heat insulation, and keep still in the AC-room for 4 hours. Measure the temperature of the flask after 4 hours. You need to repeat the experiment with blank tube for correcting the heat-loss due to radiation and due to change in temperature of Flask. You can select cooling and/or heating (freezing and/or melting) mode. Typical readings are given below for an experiment, which showed 262 KJ/Kg of PCM in the Best Method mode and 251 KJ/Kg in Easy Method mode. 2. 60 gm PCM, packed in a tube was placed in water bath at >40°C and allowed to stabilize for 2 hours. Temperature of 60 gm material was measured as 39.8°C. 3. Specific Heat of Tube was predetermined as 11 Cal/°C (for all the weight of the tube). 4. Specific Heat of the Thermos Flask was predetermined as 60 Cal/°C (for all the weight of the flask). 5. 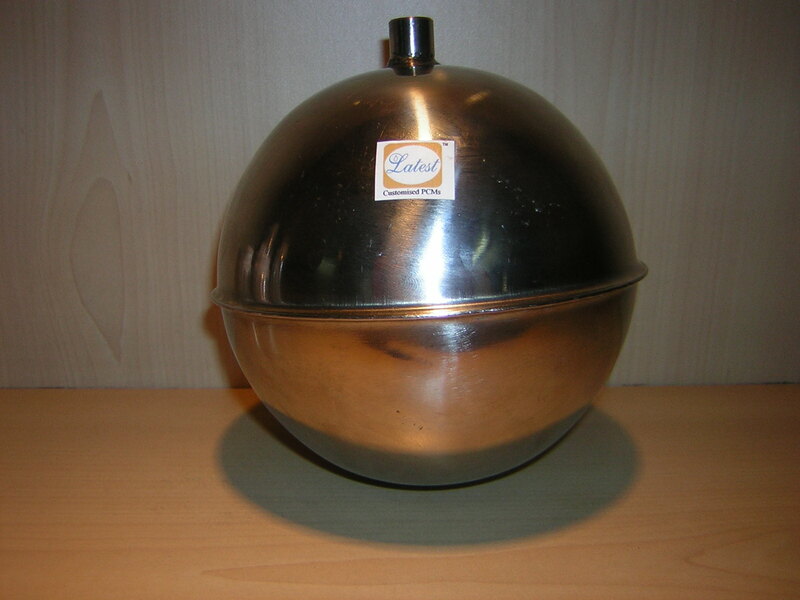 The tube as mentioned above was inserted in the flask and kept aside in the Insulated Tiffin box for 4 hours. 6. Temperature of the flask was measure after 4 hours as 21.8°C giving a ∆T of 6.9°C. This was corrected for radiation loss of 0.4°C (Blank reading at 32°C). Net ∆T was placed as 6.5°C. Latent Heat of PCM is 3552/60 --------------- = 59.2 Cal/gm or 59.2*4.18 KJ/Kg i.e. 247 KJ/Kg. 7. On reversing the experiment starting with water at 53°C and PCM at 22.2°C, we got the Latent Heat of Phase Change Material PCM as 256 KJ/Kg. As the stability of a storage system is the most important criterion of Phase Change Material performance, the influence of thermal cycling on the heat of fusion has to be studied. Most vendors do not do the stability test and rush through, offering a product on the basis of their half baked knowledge of academics. The experimental setup has to simulate the conditions to which the storage salt is to be subjected. A sample of Latest29T Phase Change Material was enclosed in a hermetically sealed glass tube. It was alternatively heated and cooled over a temperature range from 18°C to 38°C or occasionally in the range from 15°C to 45°C. The simple experimental system was almost like the one shown in Figure 1. The whole system (water bath and sample) first cooled down spontaneously in the cold room and was then heated to the set upper temperature. The rate of heating depended on the balance between the water content of the bath and the energy input. It was adjusted for a 30-min melting period to allow heat transfer through the solid phase. Care was taken to ensure total melting before the start of the cooling cycle, and total solidification before the start of heating cycle. The average duration of a whole melting-solidification cycle was 3-4 h. At 28°C, melting started, absorbing most of the energy and allowing only a slight increase in the temperature of the sample. After completion of melting, the temperature rose much faster than the extrapolation from the initial heating rate would suggest. This was evidently due to heat transfer being faster through the melt than through the solid phase. The under cooling of 2°C at about 28-29°C is characteristic of the tested system. The shape of the crystallization curves remained remarkably constant during six months through 1000 cycles and there after. In fact, the 1000th cycle could be substituted for the 12th or 200th cycle. The reproducibility of the thermal characteristics as well as the visual observation of the recurrent melting and solidification of the whole sample indicated that the latent heats did not change. This method is too tedious for those seeking only a feel of the product. They can test it by the simple method detailed below. If your climate permits, you can keep a sample of Latest29T PCM for 30 days in a way that it’s Melting Point is crossed by at least 2°C on the lower side and 2°C on the upper side for a few hours a day, to allow a sufficient driving force. You can also do this in an Air-conditioned room, where the AC is switched on and off, often. In adverse climate you can put it on window or on roofs to get the desired result. The pattern of degradation will be visible in 30 days or there about. Accelerated cooling can be done by quick dip in hot water at 45°C and in cold water at 15°C, or by microwaving and freezing. In our early experiments, we took 2 Ice-cream Boxes of 5 liters each. For testing a 30°C PCM - Phase Change Material, we filled one with Geyser water at 45°C and another with refrigerated water at 15°C. PCM - Phase Change Material about 60gm was filled in two screw-cap PET bottle. One bottle was placed in each of the boxes. Phase Change Material PCM filled bottles were swapped from one box to another box every hour. Water temperature was adjusted in each box every 4 hours. The tubes were left unattended over night. This way you can take about 6-20 cycles a day by altering the timing in each box. We at PCM-Energy are dedicated to the cause of developing Phase Change Material for Energy Savings and for improving living conditions. PCMs are green-energy sources and “Green” is the magic world to which the earth will ultimately move. We will appreciate to receive your suggestions on how to make better and cheaper PCMs that will ultimately reduce our dependence on mineral fuels. We will also appreciate to receive your suggestions on how to simplify the PCM testing methods. We possess extensive Know-how, Men & Machinery and Research & Testing Facilities to make Phase Change Material PCM in a temperature range of 35°C below zero to 155°C above zero. Items in the range >100°C are ordinarily called Heat Treatment Salts. We can offer Heat Treatment salts up to 1100°C. 1. Which Phase Change Materials PCMs are used in B.T. Shelters? In India, Phase Change Material PCM or Thermal-Salt29 is used for B.T. Shelters. Melting Point of 29°C is generally asked for by the users. Ordinarily around 12 KWH of Back-up AC is stored in a B. T. Shelter. In a Telecom Shelter, this back-up can provide cooling for heat gain due to BTS, solar load etc. for about 6 hours, in the event of a power failure. In out-door BTS, that are air cooled, you can use Thermal-Salt36 or Thermal-Salt33. 2. Should the Melting Point and freezing Point of PCM be the same? Ideally the melting point and the freezing point must be the same. However some driving-force is needed for the crystals to form. It is normal to accept a sub-cooling of 2°C. 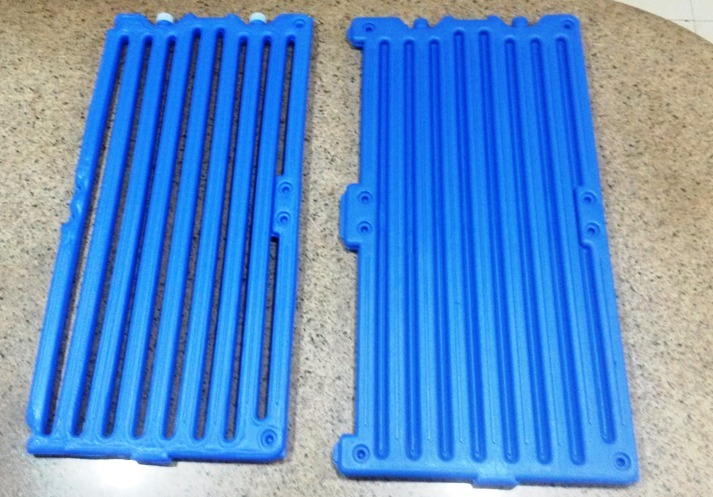 If the sub-cooling is very high, then the material will not freeze when the Air-Conditioning is on and hence no Latent Heat will be absorbed when the power is off. 3. Is it necessary to restrict to 29°C Thermal Salt for AC Back-up? T-series Phase Change Material PCM Salt can be offered in the temperature range of 18-29°C phase change. Depending upon your equipment needs, you can select the PCM of any temperature in the range of 18-29°C. S-series is offered in 30-36°C. Higher Target temperature can also be offered. 4. Will there be any significant loss in Latent Heat if lower temperature PCM is selected? Latest TM offers T-series Phase Change Material PCM in the range of 18-29°C Melting Point having theoretical Latent Heat between 180-188 KJ/Kg and practical recovery of Latent Heat of >175 KJ/Kg. 5. What is a good quality Phase Change Material PCM? a. The Phase Change Material PCM should preferably (not necessarily) be translucent or mildly hazy. b. Encapsulation should be in Natural Virgin HDPE Profiles and not in colored or opaque profiles. This will enable the user to have a look at the performance of the PCM from time to time. c. Often the PCM is thickened by a brown-colored clumping agent. This will restrict the life of PCM to around 100 cycles or there about. Some PCM’s are thickened by using starch-like substances. This is a bio-degradable material and it will restrict the life of PCM. It is buyer’s job to insist on not accepting such material. This point has been highlighted in literature and researchers now class such PCMs as limited utility PCMs. 6. What happens if the Phase Change Material PCM used is faulty? a. There is stratification (separation of layers) in the PCM. b. PCM is not frozen at normal operating temperatures of the Shelter. 7. Is there any simple way of testing the stability of samples? If your climate permits, you can keep a sample of Latest29T PCM for 30 days in a way that it’s Melting Point is crossed by at least 2°C on the lower side and 2°C on the upper side for a few hours a day, to allow a sufficient driving force. You can also do this in an Air-conditioned room, where the AC is switched on and off, often. In adverse climate you can put it on window or on roofs to get the desired result. The pattern of degradation will be visible in 30 days or there about. Accelerated cooling can be done by quick dip in hot water at 45°C and in cold water at 15°C, or by defrosting and freezing. 8. Can the degraded material be regenerated? Yes. The degraded material can be regenerated by shaking and heating it to 50-55°C. The exercise is not worth, if the degradation is due to faulty material. Regeneration may be done for expediency of use only, as the faulty material will degenerate again. 9. Can the degraded material be tested? Degradation in Phase Change Materials is due to formation of un-desirable hydrates. The crystals of un-desirable hydrates have higher Melting Point and they will not melt in the usable temperature range. You can check this by draining the degraded material from the profile. Heat the drained material to about 33-36°C and separate out the liquid layer from the un-dissolved solids by centrifuging. You can check the “Loss on Drying at 180°C” of the two layers. The huge difference is in the values of the two layers is endorsing the degradation theory. 10. Is it necessary to replace Phase Change Material PCM every year? No. Phase Change Material PCM manufacturer must be conscious of giving “Value for Money”. A PCM buyer should expect the PCM to perform like furniture, if not teak-wood furniture then at least like cane furniture. Latest TM maintains that they are offering “Teak”. 11. When is 36°C PCM preferred? 36°C or thereabout is preferred for Non-Air Conditioned Outdoor Shelters that are Air-Cooled. The air temperature can be maintained at about 38°C maximum, even when the ambient temperature crosses 40°C. 1. How to convert available values from one unit of measurement to another unit of measurement? People in different age group and in different countries are used to one way of measurement or another. With so many different units of measurement, it is not easy to correlate the data from one unit type to the type you are used to. These days such conversions are available on-line. Just search for one of the values and you will stumble upon a site that gives you ready made conversion from pounds… to kg… and so on. You can use the below mentioned data for your ease. 1C or (273+1)K ------ = (1*9/5+32)F ------ = 33.8°F. 1 Meter. ------------ = 1*3.28 Feet. ----- = 3.28 Feet. 1 Sq. Meter. -------- = 1*10.77 Sq. Ft.--- = 10.77 Sq. Ft.
1 Cu. Meter. -------- = 1*35.29 Cu. Ft. -- = 35.29 Cu. Ft.
1 Kg. --------------- = 1*2.2 lb. -------- = 2.2 lb. 1 KCalorie. --------- = 1*4.18 KJoule. --- = 4.18 KJoule. 1 KJoule. ----------- =1*0.95 BTU. ------- = 0.95 BTU. 1 KWatt. ------------ = 3412.14 BTU/Hr. -- = 3412.14 BTU/Hr. 1 Ton Refrigeration - = 1*3.517 KW. ------ = 3.517 KW. 1 KWatt. ------------ = 1*1.34 HP. ------- = 1.34 HP. 2. What are the Types of PCMs? What is the peculiarity of each type? Phase Change Materials PCMs can be broadly classed as Organic and Inorganic. Organic Phase Change Material PCM can be Aliphatic or Other Organics. Users rarely specify the use of Organic Phase Change Materials PCMs. Latest TM can offer Organic PCMs in low temperature range. Organic PCMs are expensive and they have average Latent Heat per unit mass and low density. Most items in organic PCM range are combustible in nature. They also have a wider range of Melting Point. Some customers specify the organic PCMs wanted by them and we offer them as per their needs. Inorganic Phase Change Materials are generally Hydrated Salt based materials. Academicians are likely to misguide you into using pure hydrated salts like Sodium Sulphate Decahydrate and so on. Hydrated salts have a number of hydrates and an anhydrous form leading to stratification of material and loss of Latent Heat recovery with time. Hydrated salts also have a sub-cooling tendency. Old generation PCM manufacturers managed to add performance enhancing agents. These agents do help in delaying the degradation of PCMs for say 100 cycles or thereabout. However, they do not address the basic reasons due to which sub-cooling and degradation happens. Earlier researchers emphasized that it is beneficial to use impure grades of base material as it promotes the growth of crystals and prevents sub-cooling. However impurities also promoted growth of undesirable hydrates leading to stratification. Experts on crystallography have managed to identify the “Preferred Crystal Nucleation” method. It consists of a “Cold Finger” that nucleates and promotes the growth of desired crystals and “Selective Elimination” or “Detoxification” whereby any impurity that promotes the growth of undesirable crystals is removed. The current methods of Phase Change Material PCM manufacturing are like the new generation “Combination Drugs”. We at PCM-Energy are dedicated to the cause of developing Phase Change Materials for Energy Savings and for improving the living conditions on the planet earth. PCMs are green-energy sources and “Green” is the magic word to which the earth will ultimately move. We will appreciate to receive your suggestions on how to make better and cheaper PCMs that will ultimately reduce the dependence on mineral fuels. We will also appreciate to receive your suggestions on how to simplify the PCM testing methods. We are having the Know-how, Man & Machinery and Research & Testing Facility to make Phase Change Materials any temperature range from minus 35°C to plus 155°C. Items in the range >100°C are ordinarily called Heat Treatment Salts. We can offer Heat Treatment Salts up to 1100°C. Natural Air conditioning with PCM in Ceiling.